Here in Britain, it’s fair to say we are bananas about bananas. More than five billion are consumed each year, meaning that, on average, each of us gets through around 10kg, which is approximately 100 bananas. If my house is anything to go by, that figure falls way short of the mark. We’ve still got a long way to go to reach Uganda’s level of consumption, however, as Ugandans eat an average 227kg bananas per person every year – in fact, the Ugandan word for food, ‘matooke’ also means banana! Sweet, filling and portable, they’re the ideal snack. It turns out that they also make an ideal hair conditioner, but we’ll get to that a bit later. Despite its compact size, the banana is a nutritional powerhouse, packing in more vitamins and minerals than seems possible in such a small package. Many horticulturists suspect that the banana was actually the world’s first cultivated fruit. Archaeologists have found evidence of banana cultivation in New Guinea as far back as 8000 BC and bananas also appeared in Egyptian hieroglyphics. The first banana farms were located in Southeast Asia, then spread west to India and across to Africa, from where Portuguese sailors introduced them to Europe and the Americas in the 16th century. Today, India is by far the biggest producer. Have a guess as to how many varieties of banana there are. Three? 20? Well, according to the Food and Agriculture Organisation of the United Nations, there are almost 1,000, of which several hundred are edible. That said, almost all the bananas sold for consumption are cloned from just one single variety, the Cavendish banana plant, native to Southeast Asia. Before the Cavendish, everyone ate a variety called the Gros Michel, which was larger and better tasting, but was unfortunately wiped out by fungus in the 1950s. Experts fear that a similar fate could be in store for the Cavendish within the next two decades – fingers crossed they’re wrong. Plantain is the name given to the larger, starchier kind of banana that is generally cooked before eating, commonly used in Central and South America and the Caribbean. But the award for the prettiest variety, without doubt, goes to the ‘musa velutina’ – also known as the hairy or pink banana. Best stick to using it as a decorative plant, though – it’s more seeds than fruit, which makes for a rather uncomfortable eating experience! The world of bananas is far more interesting than most of us could ever imagine. For a start, they grow on huge plants (not trees) and are technically classed as berries. The banana plant is the largest in the world, growing up to 15 metres high and belongs to the same family as the orchid and the lily. A single banana is called a finger and they grow in hands (bunches) of around 10-20. The word banana actually comes from the Arabic word for finger – ‘banan’. 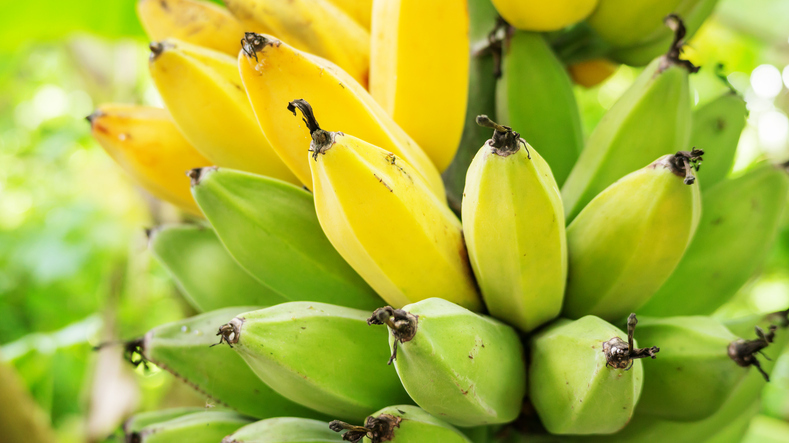 Nutritionally speaking, bananas offer impressive statistics – just a single one provides us with 29% of our daily vitamin C, 24.8% of our potassium and 83.3% of our manganese needs. They’re also bursting with vitamin A, a full range of B vitamins including riboflavin, niacin, vitamin B6, and folic acid, plus a good amount of calcium and magnesium and smaller quantities of iron and zinc. An average banana has 126 kcal, 1.8g protein, 29g carbohydrate (natural sugars), 4.4g fibre and no fat, cholesterol or sodium whatsoever, making it pretty much the perfect snack! The saying may talk of an apple a day, but bananas have double the carbohydrate, three times more phosphorous, four times more protein and five times more vitamin A and iron. Bananas are especially known for being high in potassium, which is one of the body’s most important and useful electrolytes. Potassium-rich foods boost heart health by lowering blood pressure, thus protecting against heart disease and strokes. Bananas are high in fibre, which help keep you regular. Surveys conducted among people suffering from depression have shown that many felt much better after eating a banana. This is down to tryptophan, a type of protein found in bananas, which the body converts into serotonin (which is known for aiding relaxation and lifting your mood). High in iron, bananas can stimulate the production of haemoglobin in the blood. When we feel stressed, our metabolic rate rises, reducing our potassium levels. 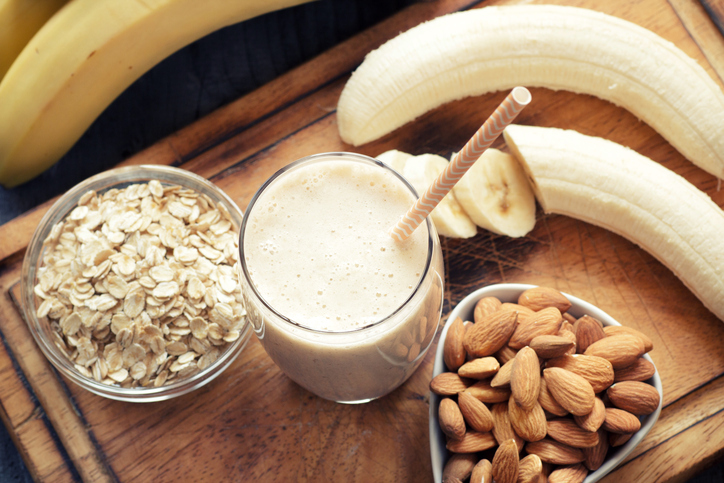 A high-potassium snack can rebalance our levels. 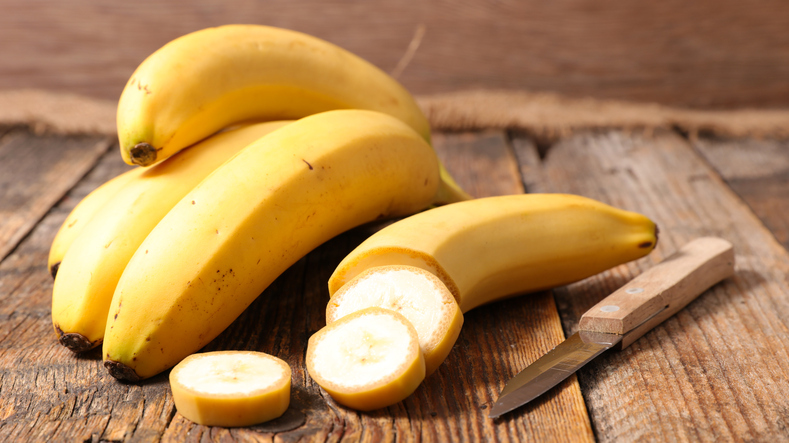 The soft, smooth texture of bananas soothes intestinal disorders, while the resistant starch in bananas has a prebiotic effect, helping to keep gut bacteria happy. 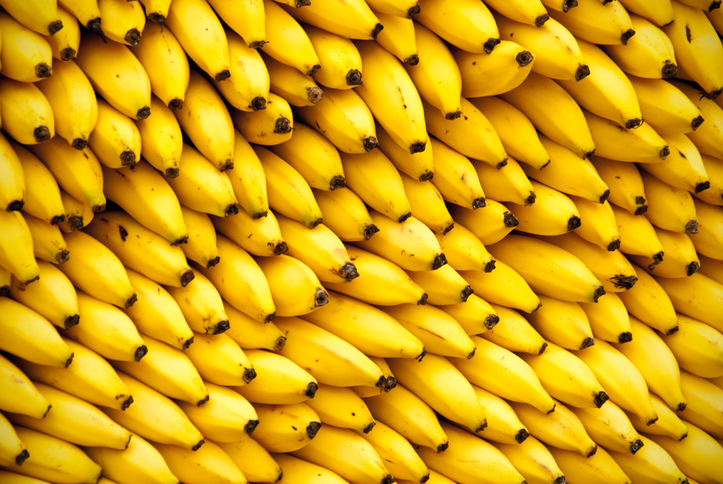 Bananas also neutralise over-acidity and reduce irritation by coating the stomach lining. Forget fried foods, one of the quickest ways to cure a hangover is to make a banana milkshake, sweetened with agave, dates or maple syrup. Bananas also make a great conditioner for dry, damaged hair when mashed with a tablespoon of soya, oat or coconut cream and a tablespoon of honey equivalent. Simply apply the mixture to dry hair, cover with a shower cap, wrap a towel around and leave for an hour before rinsing and shampooing. Don’t be so quick to throw your banana peels away! They boast their own list of proven uses that range from the medicinal to the aesthetic. Did you know that rubbing an insect or mosquito bite with the inside of a banana skin can reduce itching, swelling and irritation, for example? It’s also said that by taping a piece of peel over a splinter, the enzymes help the splinter to work its way out. Many swear that rubbing banana peel on the forehead even cures a headache! And one last little titbit that could well be a game-changer – you’re actually meant to peel your banana from the bottom up, holding on to the stem like a handle. This way you avoid all the annoying stringy bits! The scientific name for banana is ‘musa sapientum’, or ‘fruit of the wise men’. Knowing what we now know, it does indeed seem like a wise decision to eat as many of these yellow superfoods as possible!